I wanted to stop. Take a break, at least. For months -- years, really -- I've been railing against the essential unfairness of amateurism, the blinding hypocrisy of the National Collegiate Athletic Association and the "Catch-22"-shaming absurdities of campus sports. Problem is, there's just too much to write about. From the ongoing Ed O'Bannon case to NCAA president Mark Emmert's increasingly ridiculous public pronouncements, college sports are the gift that keeps on giving, a bottomless Christmas stocking full of coal. As such, I'm launching a new, semi-regular feature, dedicated to cataloging, commenting on and sometimes just laughing at the entire wheezing enterprise. Picture this: A group of individuals gathers in Santa Monica, Calif. They hail from across the nation. They labor in college sports. Live and breathe college sports. Call them The Real Victims. TRV have come together because they feel put upon. Aggrieved. They're tired of the NCAA ignoring their concerns. Fed up with the association disregarding their input. Mad as heck that Emmert and university presidents make policy decisions without giving anyone else much of a say, even though those decisions shape and constrain the workaday lives of … college athletic directors. Oh, sorry -- did you think I was talking about campus athletes? Imagine that. The bureaucrats and administrators who manage the day-to-day operations of college sports in self-enriching fashion feel shut out. Tread upon, even. They'd really like to be heard -- only they're not comfortable speaking openly to Staples, on the record, because who knows how their bosses will retaliate? … why are these ADs -- all of whom work in BCS automatic qualifying conferences -- being quoted without their names attached? Still another AD explained the need for anonymity. "We don't want the NCAA getting back at us by going looking for one of our kids who might have gotten a free soda once," the AD said. Yes. Banding together so that the people who shape and run college sports by what amounts to fiat have no choice but take your concerns and desires seriously. Quite a concept. How things should work, actually. Where have I read that idea before? If you've read any of my previous work, you know I think the entire concept of college sports amateurism belongs in history's dustbin, next to chunks of the Berlin Wall and unsold copies of John Romero's "Daikatana." Exhibit 100-A? A recently released report by the Drake Group, an independent organization of campus thinkers dedicated to ending academic corruption within college sports. 1. Are NCAA restrictions on athletes' participation in the market for their images, names and likenesses -- in other words, athletes getting a piece of the college sports money pie -- necessary to uphold the principles of amateurism? 2. Is amateurism necessary to preserve college sports? Short answers? No. And no. In just 21 pages, Zimbalist and Sack demolish the standard arguments for preserving the college sports status quo, in which revenue-producing athletes are forbidden from receiving market-level compensation because that would be impure. Or open a scary Pandora's Box of players getting money handshakes and free tattoos with wanton impunity. Or force Nick Saban to make a little less money. Or something. According to ABC News, Americans work longer days, take less vacation and retire later than anyone else in the industrialized world. In a poll, 70 percent of us said we believe we can get anything we want in this country through sheer hard work. We are not a nation of casual amateurs. We are a nation of strivers, and we expect to be rewarded for our efforts accordingly. Why hold college athletes to a different standard? What does it mean, exactly, to be an "amateur" athlete? Depends on whom you ask. The Amateur Athletic Union allows "broken time payments" -- that is, payments to athletes in training or competition to compensate them for lost income while absent from their day jobs. It also lets athletes cash in on endorsements. The United States Golf Association's amateur rules permit the same, and also allow athletes to hire agents. * The 73 schools in the six Football Bowl Subdivision conferences -- just 6.9 percent of all NCAA schools -- received 48 percent of that money, while the 267 other Division I schools received the other 52 percent. * Meanwhile, Division II schools (26.5 percent of the NCAA's total) and Division III schools (41.5 percent) received less than five percent of NCAA revenues, respectively. * The NCAA allows -- and does it really have a choice? -- six elite athletic conferences to essentially run and exclusively profit from their own college football postseason. From 2007 to 2011, those same six conferences Hoovered up $618.4 million of a total $722.1 million paid out by BCS Bowls. The Drake report also points out that the NCAA's power structure is dominated by the major conference schools. The upshot? When it comes to the financial treatment of college athletes and of small-time schools alike, college sports follows the Golden Rule: Those who have the gold, rule. I've already made the case for this here. Long article short, not paying competitive market wages to your labor force -- in this case, the athletes on the field -- means you can spend far more than necessary on other things. Like gold-plated weight rooms. Inflated athletic director salaries. Stay-Puft-Marshmallow-Man-in-"Ghostbusters"-inflated coaching salaries. Zimbalist and Sack put the latter into particularly stark perspective. Between 1985 and 2010, they report, the average salary of head football coaches at 44 Division I schools increased by 750 percent, from $273,300 to $2,054,700. During the same period, the average salary of university presidents rose by 90 percent, while the average salary of full professors rose just 30 percent. Which group is more essential to the collegiate educational mission? Another way to look at college coach pay: According to the Drake report, campus football and basketball coaches are paid on average nearly the same amount as their professional league peers, even though college programs generate a fraction of the revenue of pro teams. While NFL teams generate a rough average of $260 million annually, the top college programs earn between $40 million and $90 million. In college basketball, the top 30 schools average $15 million in revenue -- one-tenth that of the average NBA team. … these salaries make little sense economically. Defenders of the multimillion-dollar head coaches' salaries invariably chant the mantra: "Compensation packages are driven by market forces." Perhaps this is so, but in college sports market forces are artificially influenced by several factors: (a) no monetary compensation is paid to the primary workforce - the athletes; (b) the presence of substantial tax preferences; (c) the absence of shareholders demanding dividend distributions or higher profits; (d) extensive subsidies from the university and state budgets; and (e) athletic directors whose own salaries increase proportionately to those of the department's head coaches. Dump amateurism for a market-based player compensation system, Zimbalist and Sack argue, and conferences like the Big Ten wouldn't actually be forced to abandon big-time moneymaking for Division III, no matter what rolls off Jim Delany's forked tongue. They'd simply have less cash to bid on the likes of Ohio State football coach Urban Meyer. How horrifying. The line must be drawn here! The plaintiffs in the O'Bannon case filed a new round of documents and arguments last week, and as Jon Solomon of AL.com reports, one of the key takeaways is this: College sports officials aren't dumb. They know they're exploiting their workforce. 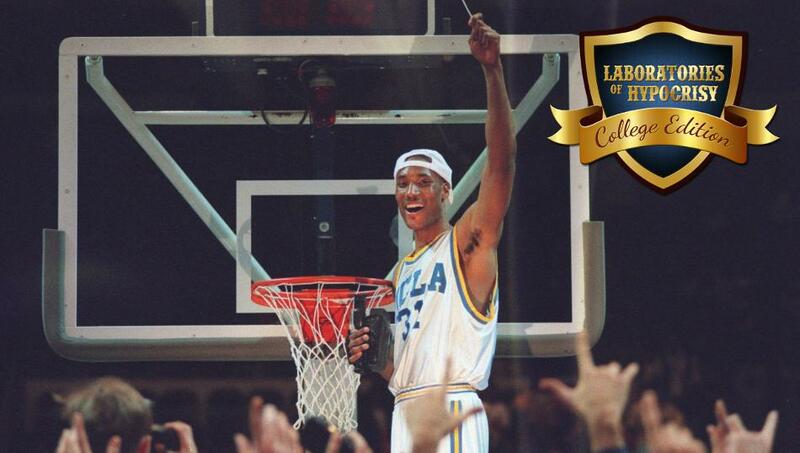 For the uninitiated, a quick O'Bannon case primer: Former UCLA basketball star Ed O'Bannon and a group of plaintiffs that includes NBA Hall of Famers Bill Russell and Oscar Robertson, as well as other former college athletes, are suing the NCAA, EA Sports and the Collegiate Licensing Company over colluding to use their names, likeness and images in products like sports video games without paying athletes. In essence, the plaintiffs are challenging the entire business model of college sports, and if they prevail, the outcome likely will be seismic change. … in one e-mail exchange in 2005, former NCAA official Bo Kerrin noted there is "real concern" that the NCAA's use of athletes' images in video games "adds to the argument that student-athletes should be unionized and receive a cut of the profits, etc." During a different 2005 e-mail exchange with NCAA Vice President David Berst, then-Ivy League compliance coordinator Brian Barrio questioned whether the use of personally identifiable characteristics of players in video games was a liability for the NCAA. Barrio said he heard the same concern at his previous job at Ohio State. "This seems to go beyond the plausible deniability inherent in selling a jersey with a uniform number but no name on the back," Barrio wrote. "Is anyone at the NCAA tracking on this issue? We wanted to make sure there is an awareness of the level of identification in this game, given that it is presently one of the highest-selling video games on the market." Later in that e-mail thread, NCAA membership services official Steve Mallonee raised similar concerns with NCAA colleagues Kevin Lennon and Kerrin. "The jersey number along with the position and vital statistics is clearly an attempt to have the public make the association with the current student-athlete," Mallonee wrote. "And it appears to be working. The Best Damn Sports Show was aired several weeks ago and had (then-USC football players) Matt Leinart and Reggie Bush acknowledging that they were in the video game. "That then raises the issue of whether getting in line with technology means being more restrictive or lenient with our rules. ... The biggest concern I have is that such a position really does allow for the maximum commercial exploitation of the (student-athlete) and if that occurs, will it be long before we can defend not giving them a piece of the profits?" Notice the bolded part. The NCAA isn't concerned with "maximum commercial exploitation" of college athletes -- the very thing amateurism allegedly "protects" said athletes from, a concept whose sheer unabashed dubiousness makes New Coke look like a brilliant idea -- but rather with damaging the plausible deniability that helps it defend itself from having to share the profits. Plausible deniability is crucial. It's basically the lifeblood of contemporary American legal defense, how everyone from politicians to corporations to Wall Street bankers gets away with, well, everything. First rule of Plausible Deniability Club? Don't talk about plausible deniability, not even in your emails, because somebody might subpoena them. Naturally, the NCAA's chief legal officer claims that the email quotes have been taken out of context. Which sounds totally plausible. Rules of thumb: iI you have to call yourself a "guy's guy," you aren't. If you have to explain why a joke is funny, it isn't. And if you have to run commercials asking the public to think of your organization as a spirit squad for college athletes … well, you're the NCAA. Don't get me wrong. I'm sure most campus sports administrators want what's best for student athletes. Provided said best doesn't interfere with what's best for most campus sports administrators. Here's an example: According to a new report in the Chronicle of Higher Education, some of the wealthiest programs in college sports refuse to give guaranteed four-year scholarships, while many others hand them out sparingly. Show of hands: Did you even know that college athletic scholarships were annually renewable contracts? Yep. That's right. This season's National Letter of Intent signee can be next season's thanks, but no thanks, you're a lousy player, now get lost for the good of the program roster cut. Jay Paterno's amazing below-market deal actually isn't so hot. Coaches and administrators will never admit that, of course. They adamantly maintain that scholarships are only revoked in extreme circumstances -- when a player flunks out of school, or gets in trouble with the law. This is often the case. But not always. Just ask John Calipari. The net effect of renewable scholarships is simple: They give schools a lopsided amount of leverage when dealing with -- or dictating to -- college athletes. History is illuminative. In 1948, the NCAA stipulated that schools could not withdraw financial aid if a student stopped playing a sport. After all, college athletics are an educational, amateur exercise, right? Two years later, the requirement was dropped. According to the Drake report, athletic directors in the 1960s began complaining about four-year scholarship recipients who were ending their college athletic careers early; one AD said the practice was "morally wrong" and that "regardless of what anyone says, this is a contract and it is a two-way street." The NCAA responded by passing rules that allowed immediate scholarship cancellations for athletes who voluntarily withdrew from sports or did not follow a coach's instructions, and in 1973, the association prohibited multi-year scholarships altogether. "This rule thus allows a coach to cancel an athlete's scholarship at the end of one year for virtually any reason, including injury, contribution to team success, the need to make room for a more talented recruit, or failure to fit into a coaches' style of play," write Zimbalist and Sack. "The contractual nature of this relationship and the control it gives coaches over the player's behavior has many of the trappings of an employment contract." A few years ago, I asked Dave Meggyesy -- a former NFL and Syracuse University player and outspoken athlete and union advocate -- about the renewable scholarship switch. His answer was even more blunt than the Drake report. "You know why they do one-year renewable scholarships?" he told me. "Because back in the early 1970s, the [expletive] was hitting the fan. There were a number of athlete protests, including Syracuse, Oregon and Washington, back athlete protests following [Tommy] Smith and [John] Carlos raising their fists at the  Olympics. Back to the here and now. Last year, the NCAA reversed course -- possibly out of the goodness of Emmert's heart; probably out of antitrust concerns, since renewable deals really do smell like employment contracts ---and adopted a policy allowing multiyear scholarships. We're cheering for student-athletes! Yay! Unsurprisingly, athletic officials are less than enthused. An anonymous major college tennis coach told The Chronicle that "if you give a 60- to 70-percent scholarship and the guy's not panning out, that kills you. That's a difference in 30 rankings spots easily." (Editor's note: The coach is not talking about academic rankings.) Tennessee associate athletic director Chris Fuller said that scholarships should be tied to performance, while Missouri compliance officer Mitzi Clayton said, "I'm also a big incentive person, and think it's important to teach students that, no matter what we do in life, we're all judged by our performance. That's how you move up in the world." Apparently, the NCAA spirit squad only sings when college athletes are winning. Texas women's athletic director Christine Plonsky all but argued that multiyear scholarships do college athletes a disservice. "Who gets a four-year, $120K deal guaranteed at age 17?" she wrote in an e-mail to The Chronicle. "The last thing young people need right now is more entitlement." According to calculations by Drexel University professor Ellen Staurowsky, the average Texas football player would be worth approximately $567,922 under a fair market revenue-sharing plan similar to the one collectively bargained between NFL owners and players -- far more than the $21,090 value of a Texas football scholarship in 2011-12. Meanwhile, Plonsky makes a reported $359,000 annually. Plus incentives. Her freely negotiated contract runs through 2017. Her men's athletics counterpart, DeLoss Dodds, makes $1 million-plus per year -- and after his contract expires in 2015, Texas will pay him $100,000 a year through 2020 for serving in "another capacity." Both individuals manage an athletic department that boasted a $25 million operating surplus (read: profit) in 2011-12, thanks largely to $103.8 million in football revenue, of which just $1.8 million went to cover the scholarship costs of 85 football players. But sure, the last thing college sports needs are participants with a sense of entitlement. Agree? Disagree? Have a tip for future editions of The Laboratories of Hypocrisy? Drop me a line here. I'm listening.